But what is it? Synth or synth controller? We know it’s a synth and it’s called Animoog. Marc Doty ipad from Moog Music on Vimeo. 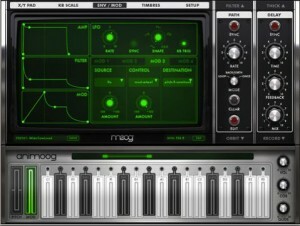 New Moog synth app for the iPad called Animoog. FILTATRON is much more than your average sound app. It’s a phenomenal real-time audio effects suite and powerful studio tool for your iPhone or iPod Touch.